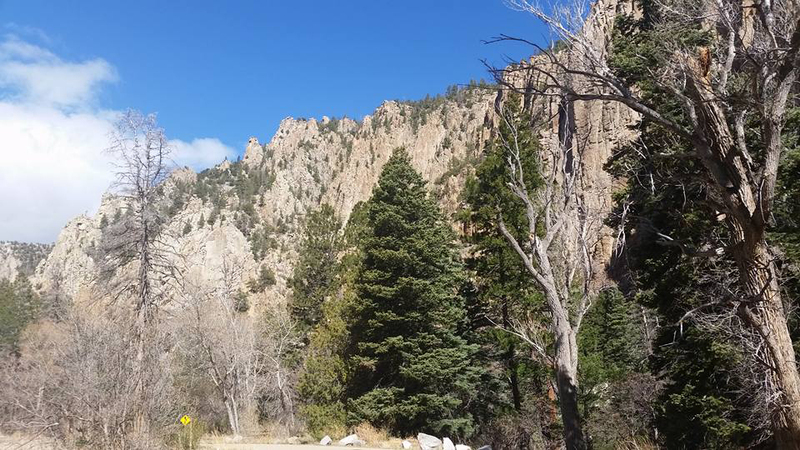 We made a trip to Taos with the intention of camping close to the Rio Grande Gorge. There is a bridge there that holds the dubious notoriety of being a hot spot for “jumpers”, ones that hope that the next life is better than this one, and look for the answers in the rocks hundred of feet below. I encountered this place on my first motorcycle trip, when I found it festooned with rosaries; I had no idea of the significance, so I took one, onyx to find out much later that it was in memorial of a suicide. Although I was ignorant at the time, I still felt terrible, so I had to make a second trip back to return it. The highway department investigated the possibility of raising the guardrails, but the additional weight would have affected the structural stability of the bridge, so they had to settle for suicide hotline call boxes at each end; I can’t imagine that being much of a deterrent for someone that distraught, but I’m sure it serves as conscious balm to the federal government(if they actually have a concious, that is). We had heard about some natural hot springs far down below that required a long hike, but this is the kind of thing we relish, so off we went; Charlie is a different dog out in the desert, bounding up and down the trail, slinging slobber, horking and whoofing, “dad! what’s the hold up?”. I would see her waaaay down below by the river, only to magically reappear in front of me, then gone again. The hot springs are truly mind blowing; 100° water seperated from the icy Rio Grande by a narrow rock shelf. There are multiple pools to choose from, which is fortunate, as some New Mexicans are a bit more liberal in their bathing attire than we are accustomed to back home. Charlie wasted no time making a complete nuisance of herself; you would think that a dog would not like hot, mineral loaded water, but if you did, you would be wrong, what an absolute goober she is. We made the looong(did I mention long?) trip back up to the canyon rim, picked out a campsite with a suitable view of the next morning’s sunrise, and drove back to Taos for a quick dinner at Orlando’s (who knew that Jessica Alba waited tables? ); went back to set up camp only to find an extended family had set up camp close to our spot, a father and son with their respective brides as well as two dogs. As I was setting up camp, I heard the sounds of a guitar coming from their camp; just so happened that I had brought the banjo, and a jam began to take place. A group of free spirits partying in the springs far below were drawn to the clamor, and began dancing around the fire pit while the stars wheeled in the crystal skies above; it would be impossible to script a more surreal or incredible happening. The temperature began to seriously drop, so Charlie and I took our leave to bury up into the sleeping bag; she had been acting strangely, moving very slowly and hunched over, which had me worried, visions of Stevie dancing in my head; she actually took on a bit of her former apoerance, the hunched over dog from the crate. Had she encountered a rattlesnake or some exotic desert thorn on one of her jaunts? When she wouldn’t even be bothered to burrow into the bag as usual, I could feel a bit of panic building, but what to do? 0300 in the desert, many hours from daylight and any possible vet services? I did the only thing I could, cramming her into bag with me to stay warm (well, a little less cold), and wait for morning. All good things come to those who wait, and the sun rose to find old Charlie wanting out of the tent to harass any potential wildlife, maybe arching and stretching a bit more than usual, but overall appearing a bit recovered. Glad Charlie is ok. Beautiful pictures but I would never go over that bridge! Your travels inspire me so much! And glad Charlie is ok! Thanks for sharing. So glad Charlie is ok.
Steinbeck and his Charlie would savor every moment of the adventures along the way, too. What wonderful memories you’re gathering. Travels With Charlie, Part Deux. I loved Travels with Charlie. Alittle worried about charlie hope it was nothing…. Had me worried, glad Charlie girl is better. Thanks for sharing your travels! Send us a short video of the campfire jams! Sounds like fun was had by all! Maybe it was just too much excitement for one day…… Glad CB is OK! Enjoy! Wow beautiful pictures! Charlie looks like she’s loving it. I really hope she’s ok. Please, more pictures! Did Charlie drink from the hot springs? That might have upset her stomach, those things are kind of like people stew.. Thank you for sharing your wonderful adventures with us. Glad Charlie is okay. Sounds like somewhere I’d love to go…..having said that, hope Charlie is doing good and it was just something she ate that will pass( pardon the mental picture). my guess is someone or something reminded her of the bad times…..morning erased the bad vibe…. I bet it was all that mineral water…how is she today? Thank you for sharing, Bret. Looks heavenly.